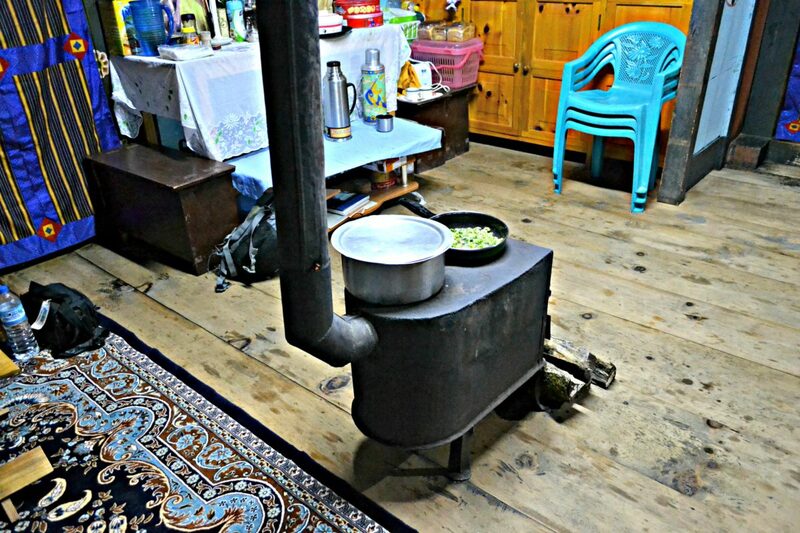 ”This is what we use to cook food in our homes” said Pema the driver, pointing to the enclosed fireplace with a chimney. The fireplace was neatly maintained, with a door along with a lock inside which the fire burnt. It was so tidy that it could’ve been easily mistaken for some shelf unless you’re informed beforehand. I was very impressed by the hygiene and the simplicity of the place instantly. I was tired from the long drive on bad roads and he’d driven me to this home in Gangtey, amidst the valley for an overnight stay. We’d driven past the dirt-track like roads in our good old Maruti 800 for a long time to reach Gangtey, from Thimphu. After he had made a stop in front of this lovely farmhouse, I was delighted with his selection. It is better to come unplanned, sometimes, I thought. And it was not just better; it was about to be the best. Pema went on with the home tour the moment we settled in. The lady of the house didn’t know English or Hindi, and he was the mediator. 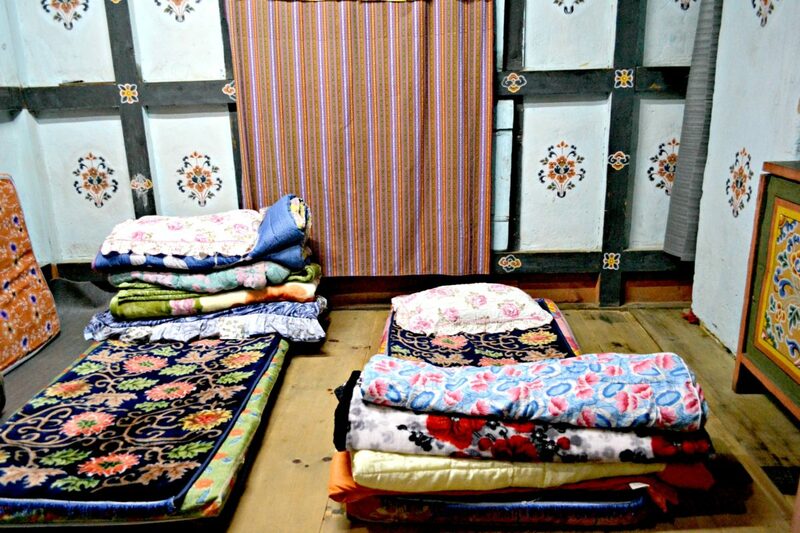 But this didn’t stop me from enjoying every moment in this cosy wooden farm house. Pema spoke broken Hindi and English but never did his excitement fade when posed with a question. 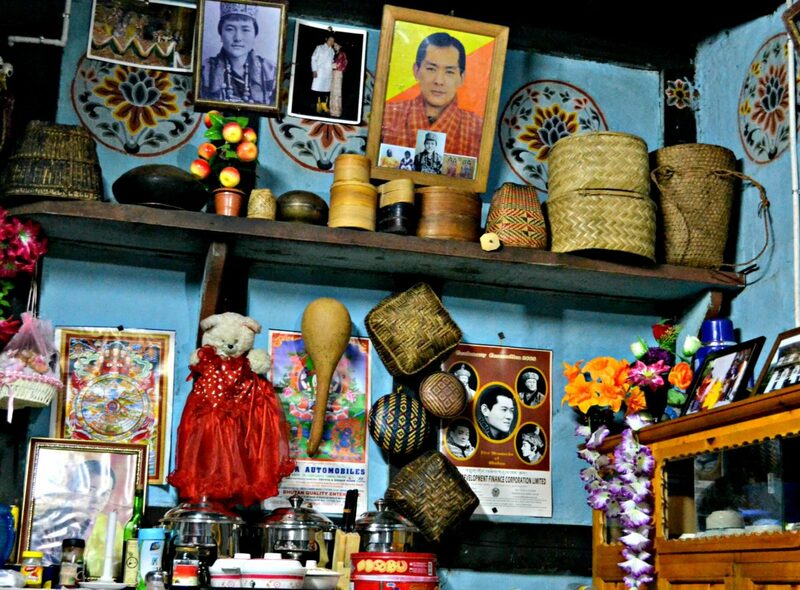 I asked him about the calendar which hung there with the photos of Kings, who’d ruled Bhutan. He went on, with pride beaming in his eyes – “The one in the center is the present king, the 5th in line. The single photo above the calendar is that of his father, the 4th king’. We all love our King very much. He always takes the best decisions for our country and consults his father, who is also one of the amazing Kings the country has seen”. “Well, you people just adore and trust your King right?” I asked, looking at the way he was respectfully saying about them. “Yes, a lot. They are nothing less than God to us. They always help people in need. People visit the royal family and never once do they come back without being helped. Many have been employed, thousands of children have attended schools because of them”. How can we not love the King? Long live our King” – sighed Pema, after saying all this breathlessly. By now, I’d gotten used to people’s respect towards the King and their belief in a Monarchy. At least one photo of the royal couple or the King hung the walls of every single shop or home. And the pride with which people spoke and their gestures were enough to let me know What King meant to them. It was one of the first cultural shocks to me as I couldn’t imagine the photos of our prime minister in my bedroom or fathom the idea of looking at our president’s face every morning. But, here people flaunted their respect and belief in their King. My eyes moved to the bird’s nest-like structure. He took it and explained that they were jugs, used in early times to get water from the rivers. Pema was already up posing, by the time I lifted my head adjusting the settings on my camera. 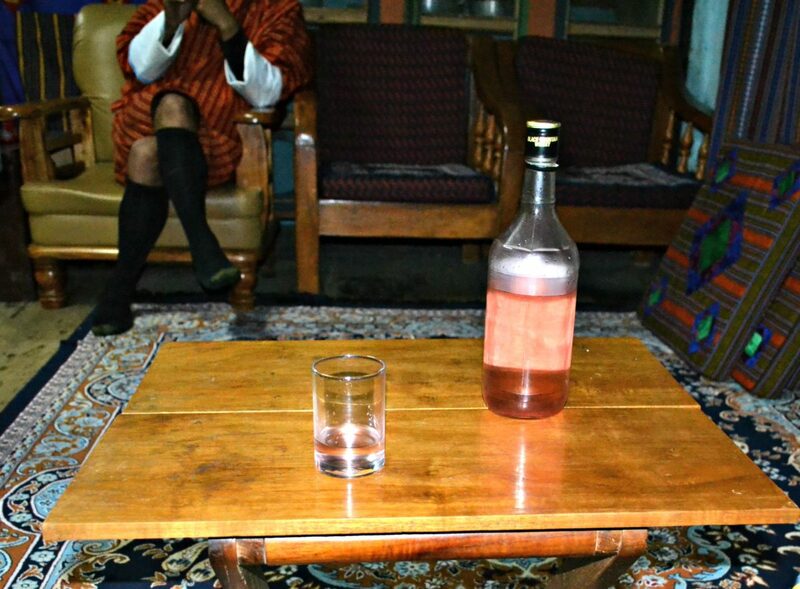 Meanwhile, the lady offered homemade red wine, and it tasted too good. After serving us tea and biscuits the moment we’d come in, she’d started preparing dinner for us by now. She blushed when I made signs telling her that I want to click. It reddened her cheeks Furthermore when the driver said something which I didn’t get. 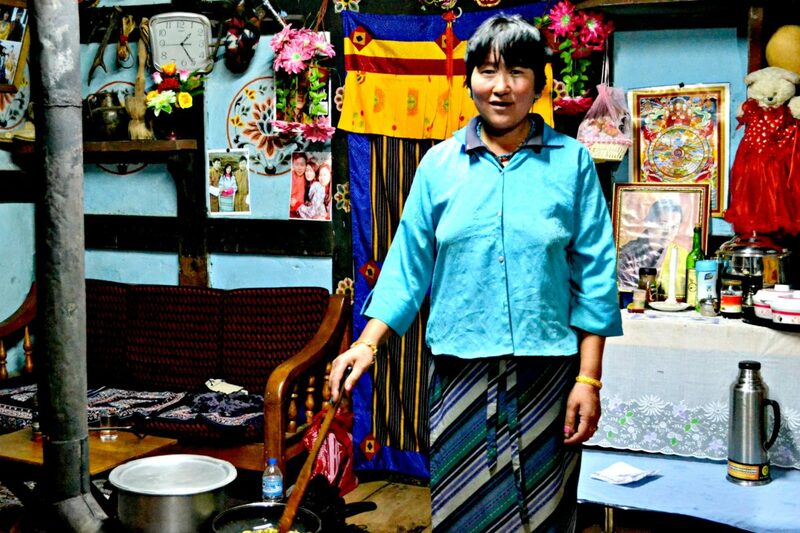 I went to the home with Pema sharing some more facts and stories. He told that Gangtey was a sleepy town and more isolated. 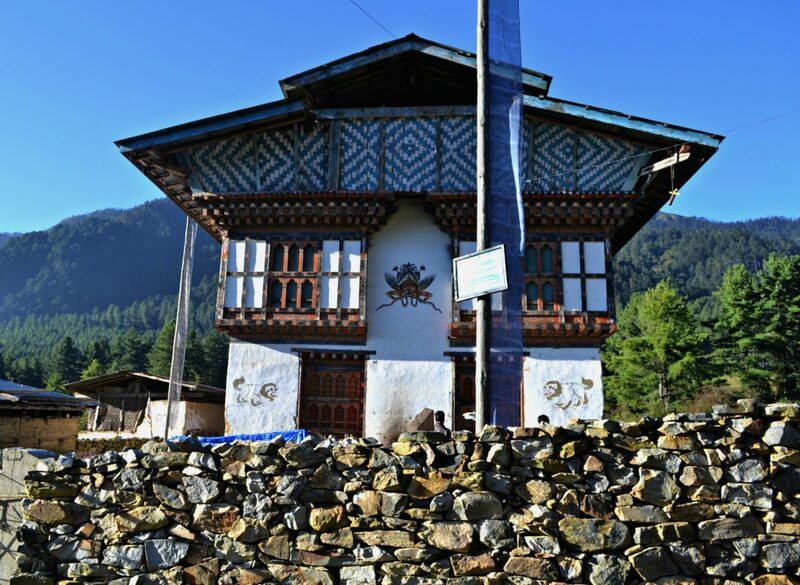 And the neighboring city of Trongsa was very popular until now, as few of the former Kings came from this region. 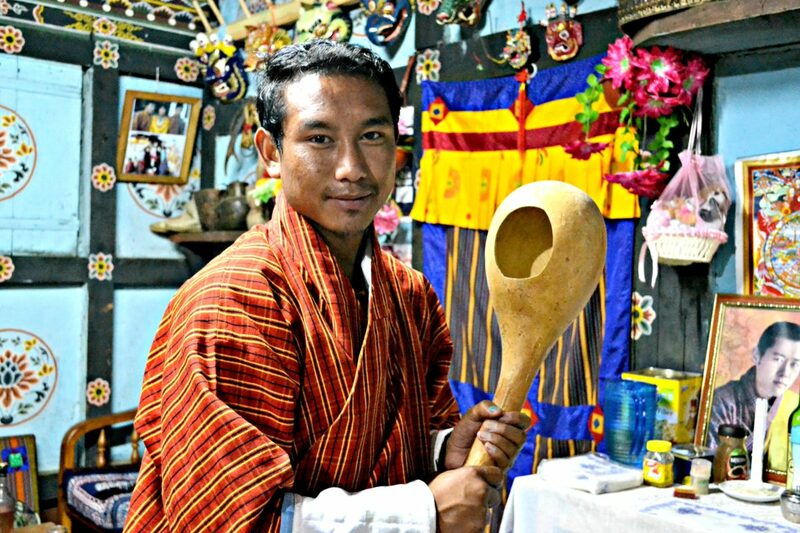 He also told that most of the muscular and talented men hail from Trongsa and Trongsa has also produced many singers. The reason he gave was funny, though – that people consume the holy water flowing through this region, which is what makes them blessed singers. He made a poker face stating how unlucky he’d remain, although he’d drank so much of the same holy water! Gangtey or Phobjika valley is where the rare species of black-necked cranes come, at the end of October or November. After staying for about four months, these beautiful birds fly north to migrate to Tibet. It is when most tourists visit this place, despite the weather getting icy, with chilly nights.But the greenery dominated the landscape while I was here, offering me magnificent views. By now, the dinner was ready. The menu was Buddhist as said by Pema and I was treated to a traditional Bhutanese vegetarian dinner comprising of Red rice, Ema Datshi, Bitter gourd fry, boiled vegetables and Cabbage cheese. Ema Datshi was way too spicy, although it was good. 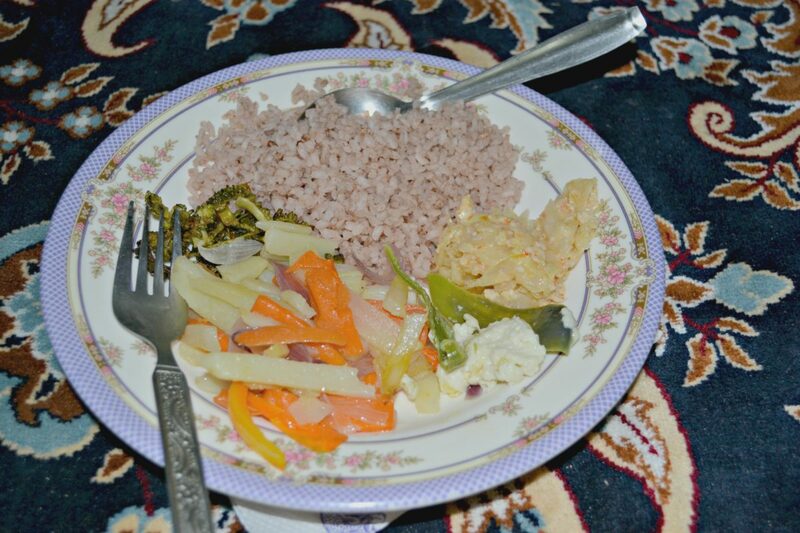 By the way, Ema Datshi is chillies with cheese sauce – a traditional dish of Bhutan, mainly taken with Red or White rice. We chatted for a long time sipping wine after an early dinner, with topics ranging from Bollywood to Politics to Corruption in India to Chinese government – Yes, there was no boundary for the issues that flew and Pema was not short on words on any of these. I had to switch over to the luxury of a cot as I couldn’t bear the cold, which had set in with the passing night. It was 9 PM there but felt like midnight in that remote village. 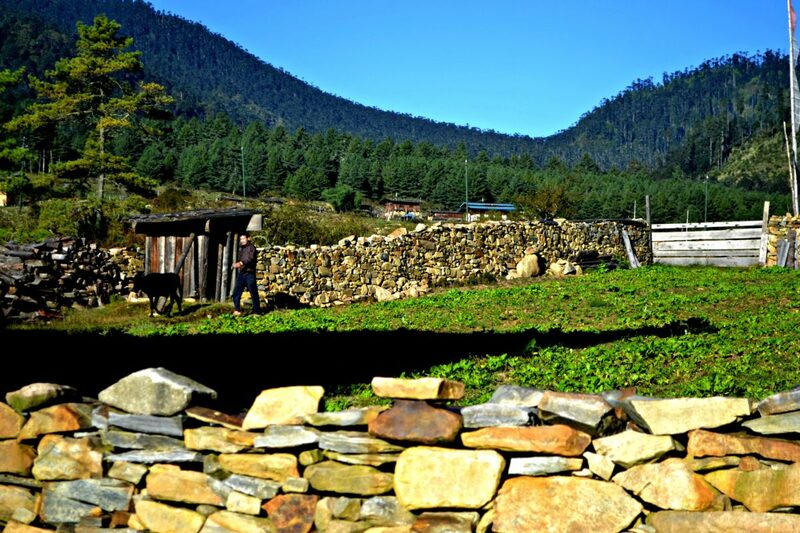 I went to bed thinking about the friendly nature of the people of Bhutan and the images of the beautiful valley of Gangtey passed over my mind like a film.With no distractions and the lack of the amenities of the modern world like the internet or proper network or good power supply, sleep caught up with me quickly. It was a brief stay where time flew quickly. But, it was an experience which would remain with me for years to come. 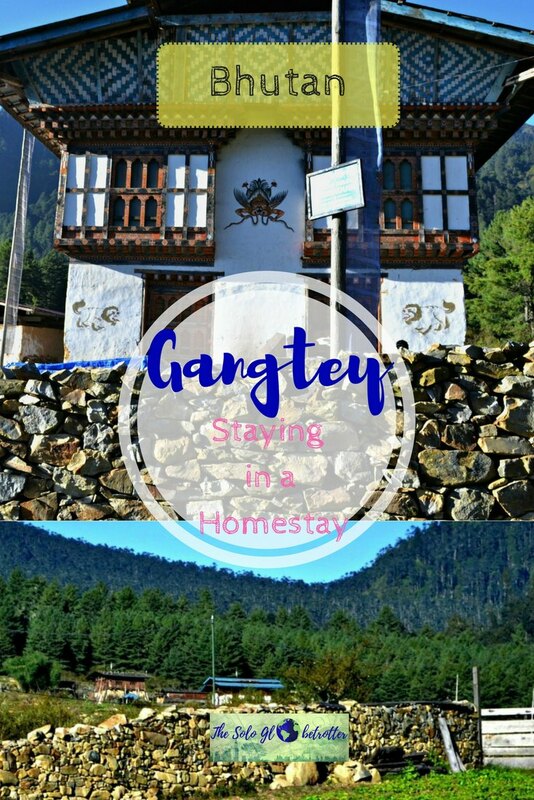 Be it interacting with sign language with the sweet lady or sipping the hot tea on a cold morning or gossiping through the night with cheerful Pema – it was a day which gave me a glimpse of the people’s way of life at home in Bhutan. 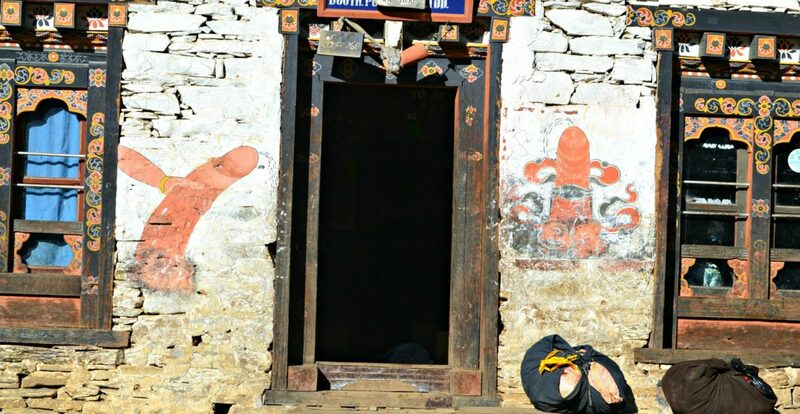 I sat in the car to venture further into Central Bhutan, wondering how being unplanned can lead to wonderful encounters and beautiful experiences. Have you ever had an unplanned stay? How did it turn out?